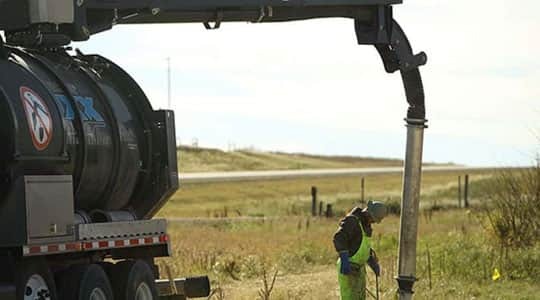 Hydrovac trucks are utilized for debris removal and/or for precision excavation, which is required when excavating near underground utilities or in confined areas. Hydrovac trucks work by injecting water into the ground through a hose, which liquefies the soil. When the soil becomes a slurry mix, it is then vacuumed up using a powerful pumping system. This slurry mixture is then stored in a self-contained tank on the truck. This process can be used to dig up to 40 feet deep. The excavation process can be used in almost any soil type, even in frozen ground.